We embarked on our first Walking Enchantment journey and it proved to initiate the inspiration we were out to capture in this enchanted State. 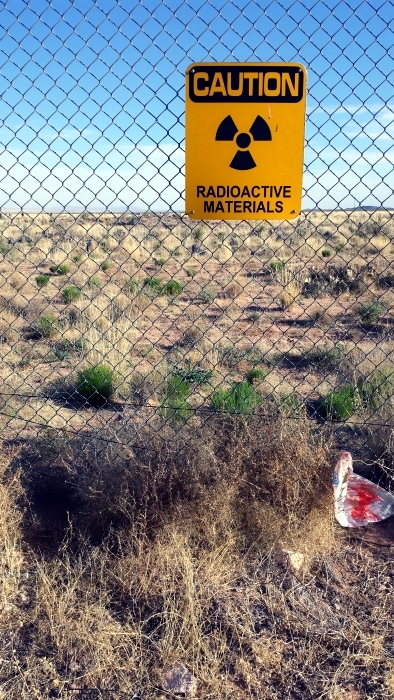 We began in the early morning and arrived at The Trinity Site, ground zero to the first atomic bomb testing. Just past the warm reception we entered the area that on July 16, 1945 @ 5:29:45 a.m the 19-kiloton explosion sounded and the world was ushered into the atomic age. 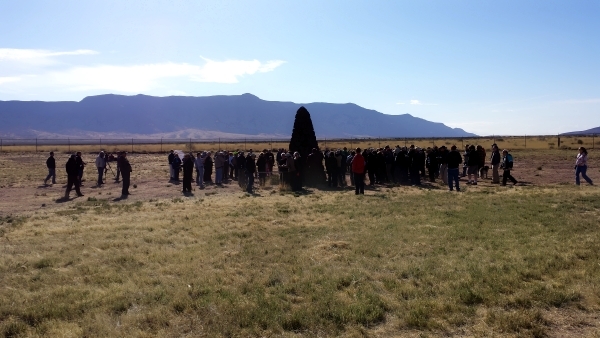 This obelisk, made from the lava rock native to many areas of New Mexico, marks the exact location the detonation occurred. One of the most captivating forces of our experience today was the mass number of people that were present to account for this location’s history. As we spent time absorbing the area’s voice the number only grew and grew. Above is one of the smaller crowds viewing detonation site memorial. Although in mass, even this active, aware human energy was not match for the oppressed earth. Children running in the area, touring groups in “take our picture” moments and a few friendly demeanor volunteers didn’t add to the quality of the area…it was stifled by human presence and no amount of human presence, even joyful, can be felt in the resonation of the site. Only one lost pencil and a lot of heavy energy later we were back on the road and in route to the White Sands of the Tularosa Basin of New Mexico. 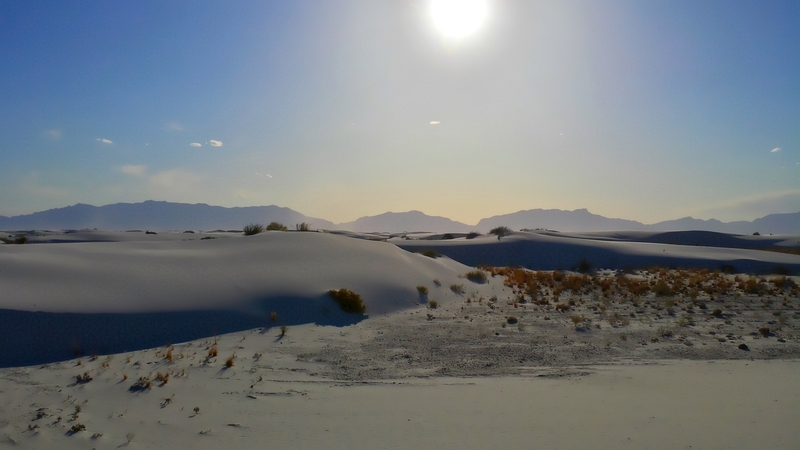 There is only one way to articulate the captivating beauty of White Sands…. As if a mirage in the middle of this high desert landscape the White Sand Dunes appear and beam with a shimmering warmth. It is a breathtaking place and the creation of this area began millions of years ago in the planets history. 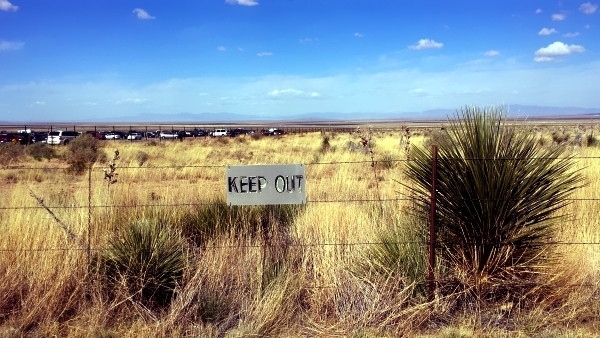 After shifting from a once flat sea bed, this area was then raised into the beginnings of the Tularosa Basin approximately 30 million years ago. The area of the Dunes has lived every life path the environment can have, yet these gypsum sands that arose close to 10,000 years ago are the living gift of the area, some dunes migrating 30-40 feet per year. This landscape is living, breathing and still shifting and its clear that nothing will be in the same place it was the last time of your visit. We rise early tomorrow for more time with the sunrise in the dunes and are certain this inaugural trip on the Walking Enchantment journey will be a remarkable experience that we are grateful to live out. A portion of the proceeds from the Walking Enchantment project sales will benefit the top nominated charities sponsored in our fundraising program that will be announced very soon in August 2014! We appreciate your support of this project and our donation opportunities with your friends, family and social media communities!